HONG KONG, Aug. 15, 2017 /PRNewswire/ -- Equinix, Inc. (Nasdaq: EQIX), the global interconnection and data center company, today announced an expansion in Hong Kong with the opening of its fifth International Business Exchange™ (IBX®) data center, known as HK5. Built in close proximity to financial data center hubs and subsea landing stations, the new US$32 million facility is tailor-made to meet demand for interconnection from the city's financial services firms and other industries. It is scheduled to open in the fourth quarter of 2017. According to a recent study by Microsoft,1 business leaders in Hong Kong are showing urgency in embracing the fourth Industrial Revolution, and 66 percent recognize the need to transform to a digital business to enable future growth. However, the study also cited a lack of supporting Information and Communication Technology (ICT) infrastructure as one of the major barriers to digital transformation. HK5 will play a crucial role in providing interconnection, which is a key piece of the infrastructure on which Hong Kong's most successful industries—such as financial services and FinTech firms—rely to drive innovation, remain competitive and continue to grow. Located in the heart of Hong Kong's financial data center nexus of Tseung Kwan O, the eight-story facility is purpose-built, designed from the ground up to satisfy the stringent regulatory requirements imposed on financial services firms. In addition to robust reliability and disaster preparedness, HK5 provides customers with the highest levels of security, compliance and operational excellence. With more than 48,000 square feet of colocation space, HK5 will add 1,200 cabinets to the global interconnection leader's footprint in the city upon completion. 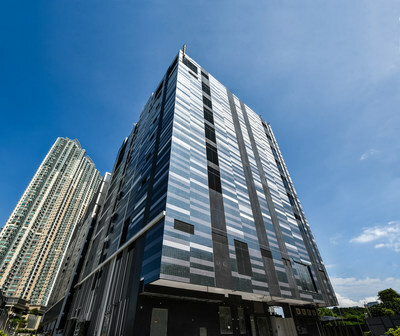 Located in a brand-new building in an area specifically zoned for data center use, HK5 offers unique scalability, reliability and high-performance colocation and interconnection services. HK5 is connected to HK1, HK2 and HK3 via diverse path fiber connections, creating a digital campus that allows customers residing in HK5 to reap the benefits of other Equinix IBXs in the city. This also makes HK5 the ideal backup and/or expansion location for customers already deploying in other Equinix Hong Kong data centers. HK5 offers the flexibility and scalability to meet changing business needs by offering access to one of the world's richest and most diverse digital ecosystems. This enables businesses to interconnect directly to more than 425 companies colocated with Equinix in Hong Kong. HK5 employs green features including granular temperature monitoring, cold aisle containment and optimized lighting control to deliver a high degree of energy efficiency. In line with the Equinix sustainability philosophy, the new data center has a small environmental footprint, with an annual average PUE (power usage efficiency) as low as 1.45. Apart from HK5, Equinix recently announced a series of expansions in Asia-Pacific, including Hong Kong, Melbourne, Singapore, Sydney and Tokyo. With the addition of HK5, Equinix will have 30 IBX data centers in Asia-Pacific, and its total global footprint will cover more than 180 IBX data centers across 44 markets. Hong Kong data centers are business hubs for more than 125 financial ecosystem participants, such as FXecosystem, a leading provider of outsourced connectivity services to the FX and bond markets. The company colocated with Equinix in New York (NY4), and has since expanded into London (LD4), Hong Kong (HK1) and Singapore (SG1). "Equinix's strong reputation in the financial services industry, combined with its largest multi-asset electronic trading ecosystem - a robust collection of interconnected execution venues and trading platforms, market data vendors, service providers, buy-side and sell-side firms, made it the obvious choice to support our Asian expansion. Leveraging Equinix's interconnection platform across Hong Kong, London, New York and Singapore, we are able to help institutional and retail FX clients in Europe and America to expand into Asia." "With the recent data center expansions in Singapore and Sydney, and now the opening of HK5, Equinix continues to expand its presence across Asia-Pacific. Our ongoing growth signifies our commitment to the region and to developing our global footprint to benefit our customers and support growing digital business needs. The launch of HK5 will enable our customers in Hong Kong and beyond to have access to the vast interconnection opportunities needed to innovate and grow." "With companies in Hong Kong rapidly embracing the multiple opportunities offered by the digital economy, the demand for interconnection continues to rise. Equinix has always offered the premium services and scale required by the city's enterprises, including the many financial services firms that make up our customer portfolio. With the opening of HK5, we will continue to deliver the level of excellence and interconnection that industry regulators expect and which our customers demand." Equinix, Inc. (Nasdaq: EQIX) connects the world's leading businesses to their customers, employees and partners inside the most interconnected data centers. In 44 markets across five continents, Equinix is where companies come together to realize new opportunities and accelerate their business, IT and cloud strategies. Equinix.hk. This press release contains forward-looking statements that involve risks and uncertainties. Actual results may differ materially from expectations discussed in such forward-looking statements. Factors that might cause such differences include, but are not limited to, the challenges of acquiring, operating and constructing IBX centers and developing, deploying and delivering Equinix services; unanticipated costs or difficulties relating to the integration of companies we have acquired or will acquire into Equinix; a failure to receive significant revenue from customers in recently built out or acquired data centers; failure to complete any financing arrangements contemplated from time to time; competition from existing and new competitors; the ability to generate sufficient cash flow or otherwise obtain funds to repay new or outstanding indebtedness; the loss or decline in business from our key customers; and other risks described from time to time in Equinix filings with the Securities and Exchange Commission. See recent Equinix quarterly and annual reports filed with the Securities and Exchange Commission, copies of which are available upon request from Equinix. Equinix does not assume any obligation to update the forward-looking information contained in this press release.